Venice, the most touristy place in the world, is still just completely magic to me. Ethereal, brooding and melancholy, we instantly fell in love with Venice. The quiet backstreets echo a history that spans a millennium, and yet so much of it is invisible to those who don’t dare to explore a little further. Pastel hues reflecting in quiet canals; footsteps echoing along hidden alleyways and the gentle hum of water taxis drifting along the Grand Canal: a city like no other and the perfect backdrop for romance. Here are a few of our favourite things to see and do in the city of love. Dine by candlelight at Arva, the incredible restaurant in Aman Venice’s majestic ballroom. Pick up a box of fresh Venetian pasta at Dal Moro’s Fresh Pasta to Go. We went for the Fusilli Bolognese with extra Parmigiano. Jump on a water taxi to the colourful island of Burano and eat the freshest seafood at Gatto Nero. The Spaghetti alle Vongole is divine. For something special, Da Ivo is the place to go for the finest Italian cuisine. A favourite with a-listers and locals, make sure you book far in advance to expereince this hidden gem. Fancy a casual slice? The pizza at Rossopomodoro is the best in the city. It may be in the middle of tourist central, but a trip to Venice isn’t complete without an iced hot chocolate at Caffe Florian. Founded in 1720, it's not only Italy's oldest café, but with its glittering neo-baroque decor and 19th-century wall panels, it's undisputedly the most beautiful. Don’t miss the otherworldly ‘Treasures From The Wreck of the Unbelieveable’ by Damien Hirst at the Palazzo Grassi. An incredible exhibition; it is the finest spectacle of modern art. 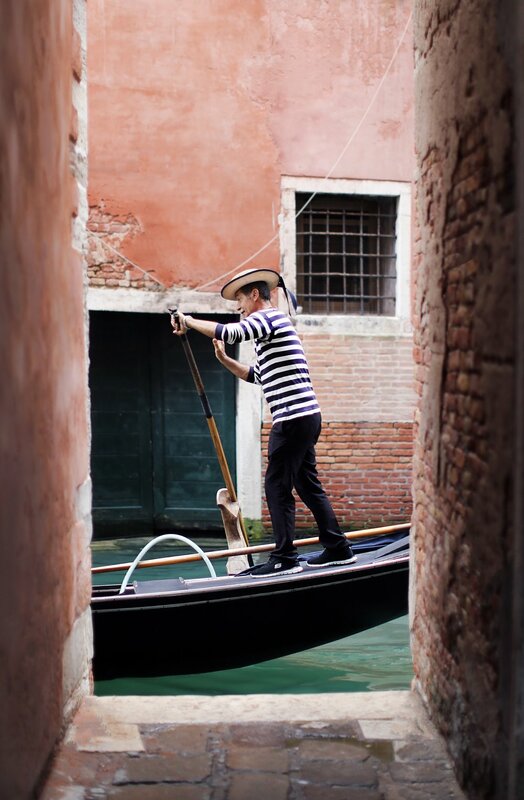 When in Venice, a gondola ride is a must. For the best route, head to the Bauer Hotel, sit back and take in this enchanting city from the water. No Venetian tryst is complete without a spectacular sunset. Book a table on the terrace at Gritti Palace or Ristorante Terrazza Danieli for one of the best views in the city. Early-rising romantics should head to St Mark's Square for a sight that most travellers miss: this awe-inspiring space with nobody in it.